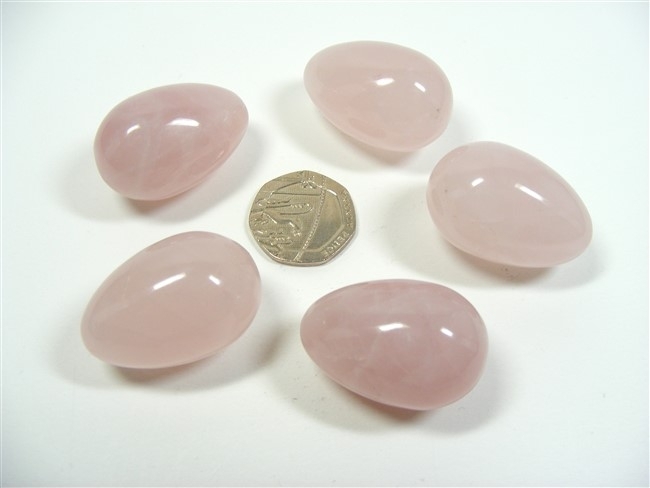 Lovely Rose Quartz egg each one with a good soft pink colour. Eggs have long symbolised birth, fertility, regeneration, springtime and the cycle of life. Ideally shaped to hold and to imagine. Rose Quartz helps in releasing excess fluids and impurities from the body, relieving stress and tension and also helps to diminish burns and relieve blistering. It can help to relieve the symptoms of vertigo and also helps with the kidneys and adrenal glands. Rose Quartz encourages feelings of peace and calm. It provides us with emotional support when we most need it and it engenders positive responses. It heightens our self esteem and is a comforting crystal reducing the fears that accompany pain and injury. Do be aware, however, that for all it calming and soothing properties, Rose Quartz can also be quite a powerful releaser of unexpressed emotions. Rose Quartz promotes unconditional love, both for ourselves and for others. It provides a sense of peace in which we can concentrate on the spiritual aspects of our lives too.